Only 4 openings left. Register now! Make design and composition work for you and your quilts. Discover the secrets of good design by learning how to arrange visual elements successfully. After doing a series of small studies based on color, value, shape, line and texture, students will develop one or more into pleasing and balanced small abstract quilt tops. Slides, discussions and visual material will extend your understanding of the nature of design, and the importance and value of critique in a supportive environment. Full class description and supply list follows the registration information below. QA 2019 is scheduled to take place at Camp Loucon, near Leitchfield, KY, on March 25-29, 2019. This workshop runs from midday on Monday the 25th to noon on Friday the 29th. Registration is open until March 1. Registration for the 5-day workshop, including meals and lodging, is $500.00. A non-refundable $50.00 deposit is due upon registration, with the remaining fee due by March 1. Need assistance or prefer not to register online? Contact Jill Branton at 859-539-3064 or jillydb@hotmail.com . Register soon so you won’t miss this fabulous opportunity! Complete and submit this 2019 QA Scholarship Application to be considered for a $300 scholarship to Quilting Adventures! DESCRIPTION: The purpose of this class is to take an in-depth look at the arrangement and organization of visual elements that make a successful composition or design, to study the raw elements of design, and see how they can be put to use in the process of quiltmaking. The class will begin with interactive discussion around the notion that the basic design elements are used in all design universally. Using slides and other visual material, we will study the purposes and different types of design and the process of design before looking closely at the elements of design, namely, line, mark, texture, shape, and color. The arrangement of elements in the design space will include discussion and demonstration of proximity, overlap, transparency, contrast, repetition and rhythm, symmetry, asymmetry, focal emphasis balance, positive and negative, and underlying structure. Paste-up exercises using inexpensive art supplies and/or fabric scraps will form the basic activity of this section of the class, but students have the option of enlarging one or more of the small pieces. “Choose any geometric shape, e.g. a circle. Do several small paste-ups using circles. You may use a template to make perfect circles or cut freehand. What difference will that make to the look of your work? What will the result be if your circles overlap, or are cropped at the edge of the paper, or are concentric or eccentric? Is the negative space pleasing to your eye? What are the value changes? Are they light on dark, dark on light or a series of subtle medium values? Now consider translating into fabric. What difference would the fabric texture and color make? Could you use transparencies? If you enlarge your design, how would the increased scale affect the positive and negative shapes? Would you break them up further and how? What techniques could you use? What could you do with embroidery, quilting or embellishment to enrich your circles? Which one do you like best and why? What other artists have used circles? Consider, among others, the work of Sue Benner, Australian aboriginal artists etc." The practice and desirability of critique, comparison and analysis will form the final part of the class as students assess their own work and that of other class members. Have seen examples of how they have been used by other artists and craftspeople around the world, with particular emphasis on quiltmakers. Have made a series of paste-ups many of which will be suitable for translation into fabric. Have actually translated one or two into small fabric works. Have developed and refined the process of critically assessing their own work and can discuss the direction in which they want to develop it. Download and print the supply and class prep list here. PREPARATION: This is the fun part even before the class! Look at windows everywhere and take pictures. Collect images and bring your variety and ideas to class. You may want to find words, poetry or writing that suggests new views and the symbolism of looking in and looking out.. You do NOT have to come with a design all worked out but just brings lots of images and ideas. 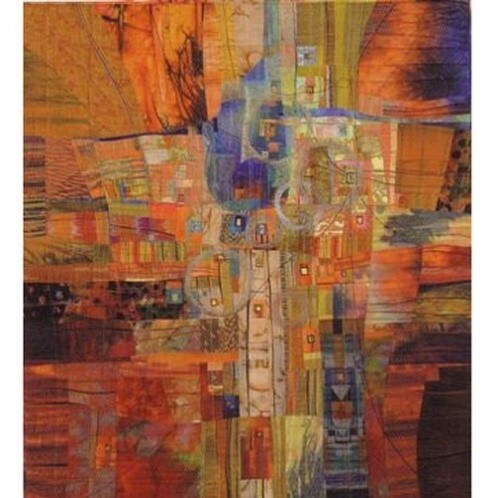 Rosalie is a South African studio artist who has been working in the fiber art, quilt and embroidery world since 1975. Her work has been widely exhibited and published nationally and internationally, and she has won several awards. She has taught and lectured in South Africa, America, New Zealand and Germany, which has allowed her to indulge her passion for textiles, travel and meeting people. Read more about Rosalie on her new website at https://www.rosaliedace.net/.